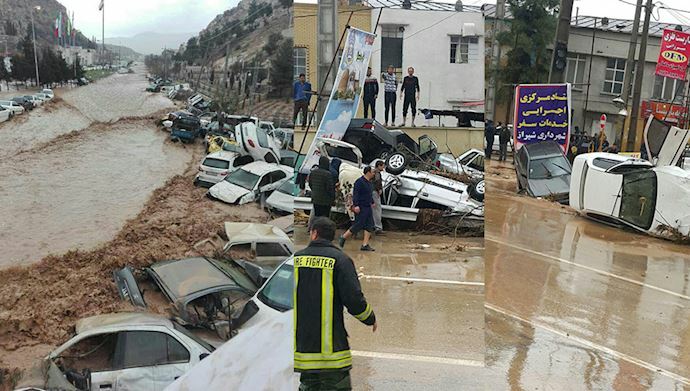 On Monday, March 25th, the National Council of Resistance of Iran (NCRI) issued a statement addressing the regime’s catastrophic mismanagement in response to the devastating floods which have ravaged 25 out of 31 provinces in Iran. The NCRI statement addresses the regime’s failure to provide emergency relief to flood survivors, its attempts to hide the true number of victims, and the regime’s role in worsening the effects of the floods. These acts of mismanagement and incompetence by authorities have caused anger in the already grief-stricken nation. According to reports from MEK sources inside Iran, people affected by the floods are still waiting for relief, but the Revolutionary Guards (IRGC) and other suppressive forces have been deployed to prevent protests instead of being sent to rescue and provide relief to flood victims. 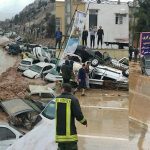 Torrential rain and strong winds led to massive flooding in Iran’s southern and western provinces on Monday. Parts of the city of Shiraz were flooded, including the Ghoran Gate and the Vakil Bazaar. Regime officials claim that 17 people were killed in the floods, but the actual number is likely to be much higher, and casualties continue to rise. The residents of Shiraz are angry at the provincial government for their failure to heed weather warnings and take actions to evacuate the area and ban vehicle from the Ghoran Gate. Hundreds of vehicles were washed away by the floodwaters. Disturbing footage of a number of people being washed away by flood waters. The mullahs' regime has destroyed the country's environment and is responsible for the lost lives of innocent Iranians. Residents are also angry at the regime for allowing the construction of roads and buildings by the IRGC and other bodies over the past few years in the area. This unregulated construction has obstructed the drainage system that had protected the city from flooding for hundreds of years. The negligence by officials has been so egregious that regime Member of Parliament Kouroch Karampour declared that those responsible for mismanaging the flood response must be brought to justice. Dozens of people have been killed or injured in the provinces of Fars, Lorestan, Khushistan, Sistan-Baluchestan, Isfahan, Bushehr, Ilam, Kermanshah, and Golestan. The city of Sarpol-Zohab, which was rocked by an earthquake last year, was further devastated when floodwaters washed away their tents and prefab constructions. The Karoun River has flooded the city of Ahvaz, creating a dire situation for residents there. In Lorestan, the Poleh-Dokthtar River has flooded the city. Mrs. Maryam Rajavi, President-elect of the National Council of Resistance of Iran, expressed her condolences to those affected by the deadly flooding and called upon the youth of Iran to protest the authorities’ mismanagement of the flood response and to demand that the regime make the IRGC’s resources and equipment available to the people so that they may prevent disasters, specifically at the Karaj dam, in Tehran and in the city of Karaj. Mrs. Rajavi also stated that the regime and its Revolutionary Guards (IRGC) have worsened the effects of the flood through their destruction of the environment. She further emphasized that the mullahs have plundered the wealth of the Iranian people on warmongering, terrorism, nuclear projects, and other projects of repression. This greed and corruption has ruined Iran’s infrastructure and robbed the Iranian people of their ability to defend themselves from natural disasters. The MEK joins Mrs. Rajavi in expressing condolences for those affected by the floods.